£3m for new Tower Hamlets only “multi-faith” cemetery – by the M25. For some years now there has been some discussion among some politicians over the lack of burial space in Tower Hamlets. In fact, like all other inner London boroughs, there is none. Traditionally over many generations, families have been burying their dead at the City of London crematorium and cemetery in Manor Park, or at the nearby Woodgrange Park Cemetery, or more lately at the Muslim Gardens of Peace cemetery in Hainault. 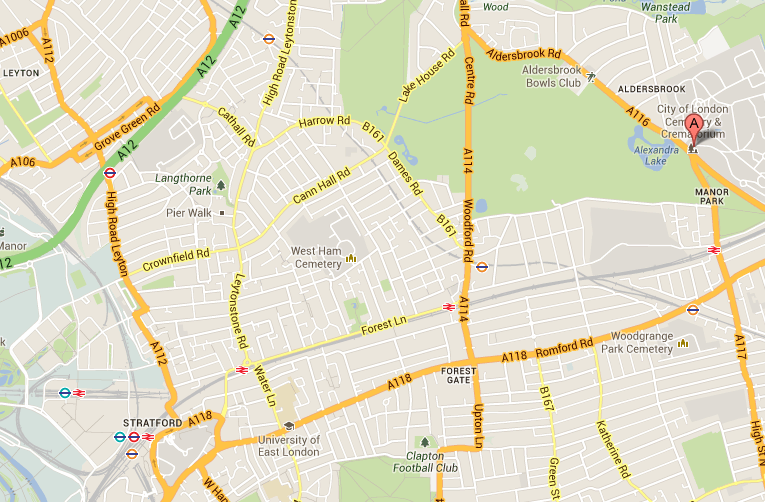 All of them are fairly accessible, not too far from Tube stations and all within easy driving distance. It’s of course a delicate matter, but the nature of cemeteries is that visits are relatively infrequent. And for many years, some Respect/Lutfurite and Labour councillors have been competing with each other to tell residents (who, we’re told, see this is as a top priority) they’ll find a more convenient “multi-faith” site in the borough. THE mayor has asked council officers to urgently explore options for a new multi-faith cemetery in Tower Hamlets. At a meeting of the council’s cabinet on December 7, Mayor Lutfur Rahman made clear that residents wanted to see options for a local cemetery brought forward for discussion. Speaking after the meeting, he said: “Local people want the option of having a burial plot within their borough. Full details of the meeting on the council website. Eighteen months on and after spending an as yet unspecified sum on consultants, Mayor Lutfur Rahman has finally realised what everyone knew at the outset: that there is no feasible space in Tower Hamlets. How do we know this? Because the Mayor has just published a “mayoral executive decision” (these things are very much below the radar: he does not press release them or email them to wider groups of residents). Instead, Lutfur and his lieutenant in charge of money, Alibor Choudhary, have decided they will spend £3million of our money (cost-cutting crisis? What crisis?!) on acquiring, with the help of an unspecified “charitable trust”, a three-acre plot of land with enough room for 3,000 graves–exclusively for Tower Hamlets residents. So where is it? According to Lutfur’s decision, it will be to the “north east of Tower Hamlets….just inside the M25”! So further away than the current options. Because negotiations are still ongoing, Lutfur has refused to say who the charitable trust is, or where exactly the plot is…but these details will emerge, I’m sure. At the same time, he has proposed scrapping the current subsidy of £225 that people get for burying their dead at the existing sites. That’s a budget of £30,000, which he has suggested will be ring-fenced to contribute to the running costs of the new cemetery “just inside the M25”. Now, the City of London cemetery is not in Tower Hamlets but it is quintessentially East End. Generations are buried together there. I’m not sure many of these families will appreciate this. I suspect that in making this decison Lutfur might well have stirred many of them into doing what they haven’t done for quite some time: get out and vote. And not for him.